Alberto Ascari (Italian pronunciation: [alˈbɛrto asˈkari]; 13 July 1918 – 26 May 1955) was an Italian racing driver and twice Formula One World Champion. He was a multitalented racer who competed in motorcycle racing before switching to cars. Ascari won consecutive world titles in 1952 and 1953 for Scuderia Ferrari. He was the team's first World Champion and the last Italian to date to win the title. This was sandwiched an appearance in the Indianapolis 500 in 1952. Ascari also won the Mille Miglia in 1954. Ascari was noted for the careful precision and finely-judged accuracy that made him one of the safest drivers in a most dangerous era. Ascari remains along with Michael Schumacher Ferrari's only back-to-back World Champions, and he is also Ferrari's sole Italian champion. When Alberto was a young child, his father, Antonio, who was also a famous racing driver, died in an accident at the 1925 French Grand Prix. Alberto once admitted that he warned his children not to become extremely close to him because of the risk involved in his profession. So this proved when he was killed during a test session for Scuderia Ferrari at the Autodromo Nazionale Monza. Ascari was notoriously superstitious and took great pains to avoid tempting fate. His unexplained fatal accident – at the same age as his father's, on the same day of the month and in eerily similar circumstances – remains one of Formula One racing's great tragic coincidences. Born in Milan, Ascari was the son of Antonio Ascari, a talented Grand Prix motor racing star in the 1920s, racing Alfa Romeos. 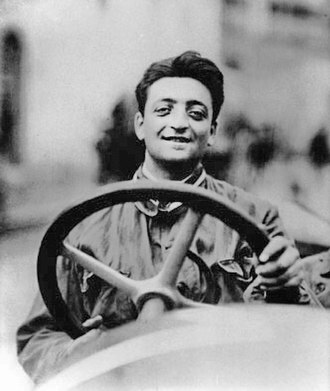 Just a fortnight before Alberto's seventh birthday, Antonio was killed while leading the French Grand Prix in 1925 at the Autodrome de Linas-Montlhéry, but the younger Ascari had an interest in racing in spite of. Such was his passion to become a racing driver like his father, twice he ran away from school. He raced motorcycles in his earlier years. At the age of just 19, Ascari was signed to ride for the Bianchi team. It was after he entered the prestigious Mille Miglia in an Auto Avio Costruzioni 815, supplied by his father's close friend, Enzo Ferrari, in 1940 that he eventually started racing on four wheels regularly. He also married a local girl the same year. 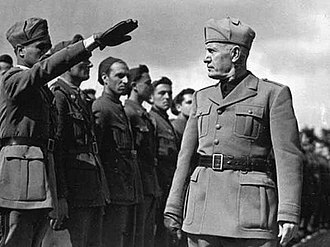 When Italy entered World War II, the family garage, now run by Alberto, was conscripted to service and maintain vehicles of the Italian military. it was during this period, he established a lucrative transport business, supplying fuel to army depots in North Africa. His partner in the enterprise was a fellow racing driver, Luigi Villoresi. The pair did survive being capsized in Tripoli harbour along with a shipment of lorries. As their business supported the Italian war effort, it made them exempt from being called up during the war. Following the end of World War II Alberto Ascari began racing in Grands Prix with Maserati 4CLT. His teammate was Villoresi, who would become a mentor, teammate and friend to Ascari. The pair were successful on the circuits in the North of Italy. Soon he was bestowed with the nickname Ciccio, meaning "Tubby". Formula One regulations were introduced by the FIA in 1946, with the aim of eventually replacing the pre-war Grand Prix structure. During the next four transitional years, Ascari was at the top of his game, winning numerous events around Europe. He won his first Grand Prix, the Gran Premio di San Remo in 1948 and took second place in the RAC International Grand Prix the same year, at Silverstone. Ascari won another race with the team the following year, Gran Premio del General Juan Perón de la Ciudad de Buenos Aires. 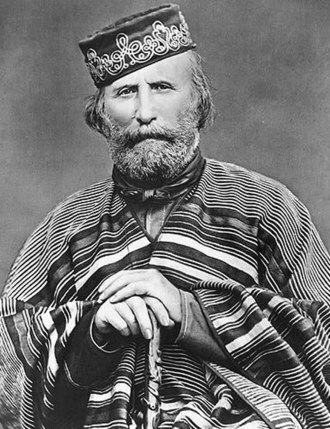 His biggest success came when he and Villoresi signed for Scuderia Ferrari. 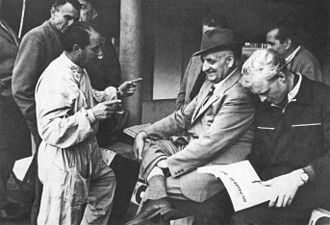 The team boss, Enzo Ferrari, had been a great friend and teammate to Antonio Ascari, and had taking a keen interest in Alberto's successes. That year, 1949 with Ferrari team and won three more races that year. The first Formula One World Championship season took place in 1950, and the Ferrari team made its World Championship debut at Monte Carlo with Ascari, Villoresi and the famous French driver Raymond Sommer on the team. The team had a mixed year – their supercharged Tipo 125 was too slow to challenge the dominant Alfa Romeo team so instead Ferrari began working on an unblown 4.5l car. Much of the year was lost as the team's 2-litre Formula Two engine was progressively enlarged, though when the full 4.5l Tipo 375 arrived for the Gran Premio d'Italia (the final round of the championship) Ascari gave Alfa Romeo their sternest challenge of the year before retiring; he then took over teammate Dorino Serafini's car to finish second. The new Ferrari then won the non-championship Gran Premio do Penya Rhin. Throughout 1951, Ascari was a threat to the Alfa Romeo team though initially he was undone by unreliability. However, after winning at the Nürburgring and Monza he was only two points behind Fangio in the championship standings ahead of the climactic Gran Premio de España. Ascari took pole position, but a disastrous tyre choice for the race saw the Ferraris unable to challenge, Ascari coming home 4th while Juan Manuel Fangio won the race and the title. For 1952 the World Championship season switched to using the 2-litre Formula Two regulations, with Ascari driving Ferrari's Tipo 500 car. He missed the first race of the championship season as he was qualifying for the Indianapolis 500, at the time a World Championship event. He was the only European driver to race at Indy in its 11 years on the World Championship schedule, but his race ended after 40 laps without having made much of an impression, as a result of a wheel collapse. Returning to Europe he then won the remaining six rounds of the series to clinch the world title (also taking five non-championship wins) and recording the fastest lap in each race. He scored the maximum amount of points a driver could earn since only the best four of eight scores counted towards the World Championship. Fangio missed most of the season after a crash in the Gran Premio dell'Autodromo di Monza in June. "When leading, he could not easily be overtaken – indeed it was virtually impossible to overtake him." He won three more consecutive races to start the 1953 season, giving him nine straight championship wins (not counting Indy) before his streak ended when he finished fourth in France, although it was a close fourth as the race was highly competitive. He earned two more wins later in the year to give himself a second consecutive World Championship. Following a dispute over his salary, Ascari left Ferrari at the end of the season and switched to Lancia for the 1954 campaign. 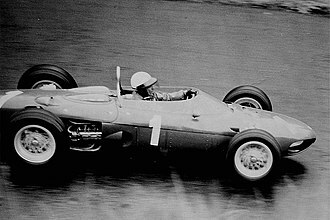 However, as their car was not eventually ready for the final race of the season, Gianni Lancia allowed him to drive twice for Maserati (sharing fastest lap at the RAC British Grand Prix) and once for Ferrari. Ascari did at least get to win the Mille Miglia that year, driving a Lancia sportscar, surviving the dreadful weather and the failure of a throttle spring, which was temporarily replaced with a rubber band. When the Lancia D50 was ready, Ascari took pole position on its debut and led impressively early on (and set fastest lap) before retiring with a clutch problem, meaning a full season of competing against Fangio's previously dominant Mercedes was much anticipated. His 1955 season started promisingly, the Lancia taking victories at the non-championship races in Turin and Naples, where the Lancias took on and beat the hitherto all-conquering Mercedes. though in world championship event, he retired in Gran Premio de la Republica Argentina. 22 May 1955, the Grand Prix Automobiles de Monaco, it was late in the race when he crashed into the harbour, through hay bales and sandbags after missing a chicane while leading, reportedly distracted by either the crowd's reaction to Stirling Moss' retirement or the close attentions of the lapped Cesare Perdisa behind. Whatever distracted him, he approached the chicane too fast, and chose the only way out and took his D50 clean through the barriers into the sea, narrowly missing a small barrel-sized iron bollard by about 30 cm. His car disappeared into the Mediterranean Sea and sank, marked only by an oil slick and stream of bubbles and steam. Three seconds passed before Ascari's pale blue helmet appeared bobbing on the surface. He was hauled into a boat and escaped with a broken nose. Just four days later, on 26 May, he went to Monza to watch his friend Eugenio Castellotti test a Ferrari 750 Monza sports car. They were to co-drive the car in the 1000 km Monza race, having been given special dispensation by Lancia. Ascari was not supposed to drive that day but decided to try a few laps. In his jacket and tie, shirt sleeves, ordinary trousers and Castellotti's white helmet he set off. As he emerged from a fast curve on the third lap the car inexplicably skidded, turned on its nose and somersaulted twice. Thrown out onto the track, Ascari suffered multiple injuries and died a few minutes later. The crash occurred on the Curva del Vialone, one of the track's challenging high-speed corners. The corner where the accident happened, renamed in his honour, has been subsequently replaced with a chicane, now called Variante Ascari. 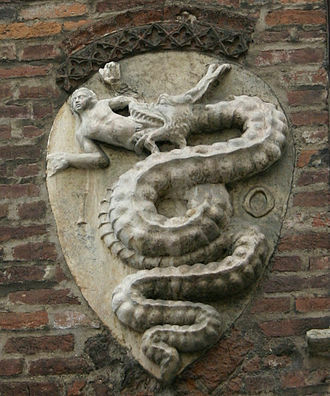 There were several similarities between the deaths of Alberto and his father. Alberto Ascari died on 26 May 1955, at the age of 36. Antonio Ascari was also 36 when he died, on 26 July 1925 (Alberto was only four days older). Both were killed four days after surviving serious accidents and on the 26th day of the month. Both had crashed fatally at the exit of fast left-hand corners and both left behind a wife and two children. Also, both had won 13 championship Grands Prix. Another curiosity related to Alberto's death is that the only other driver to crash into the harbour at Monaco in the circuit's history, Paul Hawkins, also died on 26 May. Hawkins crashed into the harbour 10 years after Ascari, before dying when his Lola crashed into a tree at a Tourist Trophy race at Oulton Park in 1969. 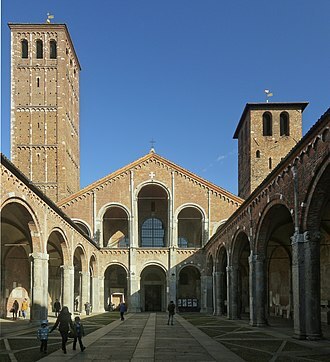 Motor racing fans from all over mourned as Alberto Ascari was laid to rest next to the grave of his father in the Cimitero Monumentale in Milan, to be forever remembered as one of the greatest racers of all time. His distraught wife Mietta Ascari told Enzo Ferrari that "were it not for their children she would gladly have joined her beloved Alberto in heaven". His death is often considered to be a contributing factor to the withdrawal of Lancia from motor racing in 1955, just three days after his funeral (though the company was also in considerable financial trouble, needing a government subsidy to survive), handing his team, drivers, cars and spare parts over to Enzo Ferrari. A street in Rome (in the EUR region) named in his honour, while both the Autodromo Nazionale Monza and Autodromo Oscar Alfredo Gálvez have chicanes named after him. In 1992, he was inducted into the International Motorsports Hall of Fame. The British supercar manufacturer Ascari Cars is named in his honour. Italian-born American racing legend Mario Andretti counts Ascari as one of his racing heroes, having watched him at the Monza circuit in his youth. Alberto Ascari also appears in Mark Sullivan's novel Beneath a scarlet sky. ^ In 1952, only the best four of eight scores counted towards the world championship. ^ Record shared with Jim Clark in 1963 and 1965. ^ Record shared with Michael Schumacher in 2004. ^ "Grand Prix History – Antonio Ascari". grandprixhistory.org. Retrieved 6 April 2016. ^ a b c d e f g h i j k "Alberto Ascari – Biography". grandprixhistory.org. Retrieved 6 April 2016. ^ a b c "8W – Who? – Alberto Ascari". forix.com. Retrieved 6 April 2016. ^ a b c "1948 Formula One Races". silhouet.com. Retrieved 6 April 2016. ^ "1949 Grand Prix Results". silhouet.com. Retrieved 6 April 2016. ^ "Monaco GP, 1950 Race Report - GP Encyclopedia - F1 History on Grandprix.com". grandprix.com. Retrieved 6 April 2016. ^ "Italian GP, 1950 Race Report - GP Encyclopedia - F1 History on Grandprix.com". grandprix.com. Retrieved 6 April 2016. ^ "1950 Penya Rhin GP". chicanef1.com. Retrieved 6 April 2016. ^ "German GP, 1951 Race Report - GP Encyclopedia - F1 History on Grandprix.com". grandprix.com. Retrieved 6 April 2016. ^ "Italian GP, 1951 Race Report - GP Encyclopedia - F1 History on Grandprix.com". grandprix.com. Retrieved 6 April 2016. ^ "Spanish GP, 1951 Race Report - GP Encyclopedia - F1 History on Grandprix.com". grandprix.com. Retrieved 6 April 2016. ^ "8W – What? – Ferrari at Indianapolis". forix.com. Retrieved 6 April 2016. ^ a b c d e f g h "Formula 1's greatest drivers. Number 11: Alberto Ascari". BBC Sport. Retrieved 6 April 2016. ^ "monza-grand-prix-june-8th – Motor Sport Magazine Archive". motorsportmagazine.com. Retrieved 6 April 2016. ^ "Alberto Ascari – Biography". www.grandprixhistoty.org. Retrieved 23 March 2016. ^ "British GP, 1954 Race Report - GP Encyclopedia - F1 History on Grandprix.com". grandprix.com. Retrieved 6 April 2016. ^ "Mille Miglia – 1954". grandprixhistory.org. Retrieved 6 April 2016. ^ "Spanish GP, 1954 Race Report - GP Encyclopedia - F1 History on Grandprix.com". grandprix.com. Retrieved 6 April 2016. ^ "1955 Non-World Championship Formula One Races". silhouet.com. Retrieved 6 April 2016. ^ "Argentine GP, 1955 Race Report - GP Encyclopedia - F1 History on Grandprix.com". grandprix.com. Retrieved 6 April 2016. ^ a b "Monaco GP, 1955 Race Report - GP Encyclopedia - F1 History on Grandprix.com". grandprix.com. Retrieved 6 April 2016. ^ a b "TheScuderia.net – Ferrari F1 – Alberto Ascari Profile". thescuderia.net. Retrieved 6 April 2016. ^ "1st Sehab Almaz Bey Trophy". 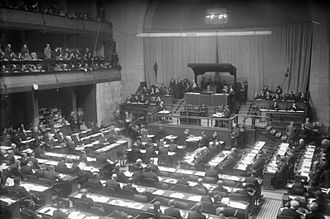 ultimateracinghistory.com. Retrieved 6 April 2016. ^ "1948 San Remo GP". chicanef1.com. Retrieved 6 April 2016. ^ "Circuito di Pescara". racingsportscars.com. Retrieved 6 April 2016. ^ "1948 British GP". chicanef1.com. Retrieved 6 April 2016. ^ "Un tributo al chueco... Palermo, Argentina 1949". jmfangio.org. Retrieved 6 April 2016. ^ "Formula 2 1949 – GP di Bari". formula2.net. Retrieved 6 April 2016. ^ "1949 Swiss GP". chicanef1.com. Retrieved 6 April 2016. ^ "Formula 2 1949 – Reims". formula2.net. Retrieved 6 April 2016. ^ "1949 BRDC International Trophy". silhouet.com. Retrieved 6 April 2016. ^ "1949 Lausanne GP". chicanef1.com. Retrieved 6 April 2016. ^ "1949 Italian GP". chicanef1.com. Retrieved 6 April 2016. ^ a b c "South American Formula Libre/Temporada Races 1946–1952". teamdan.com. Archived from the original on 23 January 2016. Retrieved 6 April 2016. ^ "1949 Belgian GP". chicanef1.com. Retrieved 6 April 2016. ^ "Formula 2 1949 – Monza". formula2.net. Retrieved 6 April 2016. ^ "GP Luxembourg". 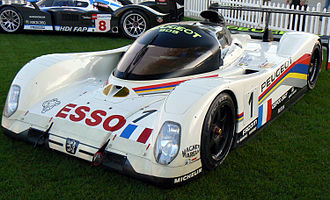 racingsportscars.com. Retrieved 6 April 2016. ^ "Formula 2 1950 – Rome GP". 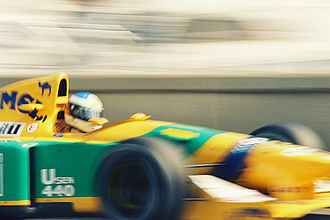 formula2.net. Retrieved 6 April 2016. ^ "Formula 2 1950 – Coupe des Petites Cylindrees". formula2.net. Retrieved 6 April 2016. ^ "Formula 2 1950 – GP von Deutschland". formula2.net. Retrieved 6 April 2016. ^ "Formula 2 1950 – Garda". formula2.net. Retrieved 6 April 2016. ^ "Formula 2 1950 – GP de Marseilles". formula2.net. Retrieved 6 April 2016. ^ "Results 1950 Formula 1 Grand Prix of Monaco". F1 Fansite. Retrieved 6 April 2016. ^ "Formula 2 1950 – GP di Monza". formula2.net. Retrieved 6 April 2016. ^ "Results 1950 Formula 1 Grand Prix of Italy". F1 Fansite. Retrieved 6 April 2016. ^ "1950 Dutch GP". chicanef1.com. Retrieved 6 April 2016. ^ "Results 1950 Formula 1 Season". F1 Fansite. Retrieved 6 April 2016. ^ "1951 Miscellaneous Rallies". teamdan.com. Retrieved 6 April 2016. ^ "Formula 2 1951 – Monza GP". formula2.net. Retrieved 6 April 2016. ^ "Formula 2 1951 – GP di Napoli". formula2.net. Retrieved 6 April 2016. ^ "Results 1951 Formula 1 Grand Prix of Germany". F1 Fansite. Retrieved 6 April 2016. ^ "Results 1951 Formula 1 Grand Prix of Italy". F1 Fansite. Retrieved 6 April 2016. ^ "Formula 2 1951 – GP di Modena". formula2.net. Retrieved 6 April 2016. ^ "Results 1951 Formula 1 Season". F1 Fansite. Retrieved 6 April 2016. ^ "Results 1951 Formula 1 Grand Prix of Belgium". F1 Fansite. Retrieved 6 April 2016. ^ "Results 1951 Formula 1 Grand Prix of France". F1 Fansite. Retrieved 6 April 2016. ^ "Carrera Panamericana". racingsportscars.com. Retrieved 6 April 2016. ^ "Results 1952 Formula 1 Season". F1 Fansite. Retrieved 6 April 2016. ^ "Formula 2 1952 – Siracusa GP". formula2.net. Retrieved 6 April 2016. ^ "Formula 2 1952 – Pau GP". formula2.net. Retrieved 6 April 2016. ^ "Formula 2 1952 – Marseille GP". formula2.net. Retrieved 6 April 2016. ^ "Formula 2 1952 – GP de Comminges". formula2.net. Retrieved 6 April 2016. ^ "Formula 2 1952 – La Baule". formula2.net. Retrieved 6 April 2016. ^ "Formula 2 1952 – GP de la Marne". formula2.net. Retrieved 6 April 2016. ^ "Formula 2 1952 – Modena GP". formula2.net. Retrieved 6 April 2016. ^ "Results 1953 Formula 1 Season". F1 Fansite. Retrieved 6 April 2016. ^ "Results 1953 Formula 1 Grand Prix of Argentina". F1 Fansite. Retrieved 6 April 2016. ^ "Formula 2 1953 – Pau GP". formula2.net. Retrieved 6 April 2016. ^ "Formula 2 1953 – Bordeaux GP". formula2.net. Retrieved 6 April 2016. ^ "Results 1953 Formula 1 Grand Prix of the Netherlands". F1 Fansite. Retrieved 6 April 2016. ^ "Results 1953 Formula 1 Grand Prix of Belgium". F1 Fansite. Retrieved 6 April 2016. ^ "Results 1953 Formula 1 Grand Prix of Great Britain". F1 Fansite. Retrieved 6 April 2016. ^ "Results 1953 Formula 1 Grand Prix of Switzerland". F1 Fansite. Retrieved 6 April 2016. ^ "Nürburgring 1000 Kilometres". racingsportscars.com. Retrieved 6 April 2016. ^ "12 h Casablanca". racingsportscars.com. Retrieved 6 April 2016. ^ "Mille Miglia". racingsportscars.com. Retrieved 6 April 2016. ^ "Results 1954 Formula 1 Season". F1 Fansite. Retrieved 6 April 2016. ^ "1955 Turin GP". chicanef1.com. Retrieved 6 April 2016. 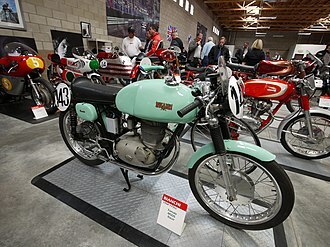 ^ "1955 Naples GP". chicanef1.com. Retrieved 6 April 2016. ^ a b "Profile for racing driver Alberto Ascari". motorsportmagazine.com. Retrieved February 2, 2018. ^ "Formula 2 Register – F2, Voiturettes, FJ, F3 and Le Mans Results". Formula 2 Register. Retrieved February 2, 2018. Karl Ludvigsen/Mario Andretti. Alberto Ascari: Ferrari's First Double World Champion Haynes Manuals Inc.. 2000 978-1859606803. 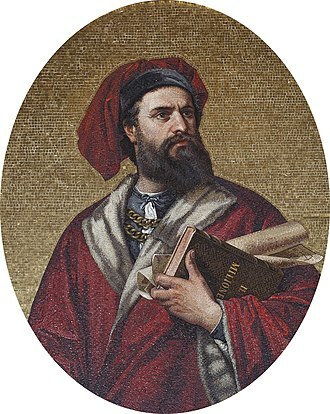 Pierre Menard/Jacques Vassal. Alberto Ascari: The First Double World Champion Chronosports. 2004 978-2847070644. Kevin Desmond. Man with Two Shadows: Story of Alberto Ascari Proteus Books, Ltd.. 1981 978-0906071090. "Most Fastest Laps in Series in One Season". Formula 1 Review. Archived from the original on 28 September 2007. Retrieved 8 February 2016. Luigi Villoresi was an Italian Grand Prix motor racing driver who continued racing on the Formula One circuit at the time of its inception. Born in Milan and nicknamed Gigi, he was the brother of race car driver Emilio Villoresi who co-piloted with him in several races at the beginning of their careers. In 1935, he raced in the Coppa Ciano, finishing third, the following year he and his brother purchased a Maserati which they drove individually in different races. Emilio was so successful that he was signed to drive an Alfa Romeo for Scuderia Ferrari in the 1937 season, in 1938, Luigi Villoresi became part of the Maserati team, driving the 8CTF model that Maserati had designed to compete with the dominant German Silver Arrows. In 1939, Maserati introduced the Maserati 4CL which Villoresi drove to victory at the the 1939 South African Grand Prix, his brother Emilio died that year while testing an Alfa Romeo 158/159 Alfetta factory racer at the Autodromo Nazionale Monza. A little over two weeks after his brothers death, he drove his Maserati to victory at the 1939 Adriatic Grand Prix and his racing career was interrupted by the onset of World War II. At wars end, he returned to race for Maserati until 1949 when he signed again with Ferrari debuting in Formula One on 21 May 1950, Villoresi finished second in the 1949 Buenos Aires Grand Prix-President Juan Peron Grand Prix. Alberto Ascari was the winner with a time of 1 hour,30 minutes,23.9 seconds, Villoresi won the first Grand Prix de Bruxelles, beating Alexander Orley of the United States. The winning time was 85 mph over 188-mile distance, louis Rosier was victorious in a blue Talbot, in a 500-kilometre Grand Prix at Spa-Francorchamps, in June 1949. He took the lead following 23 laps and came across the line in front of Villoresi. Villoresi was third in a 60-mile international race at Silverstone in September 1949, Italian drivers made a clean sweep of the first three positions with Ascari first and Giuseppe Farina second as 100,000 fans looked on. English driver St. John Horsfall died when his car crashed at a turn, Villoresi skidded on oil, penetrated a barrier, and killed three spectators at the Grand Prix des Nations race in Geneva. Mentorship is a relationship in which a more experienced or more knowledgeable person helps to guide a less experienced or less knowledgeable person. The mentor may be older or younger than the person being mentored and it is a learning and development partnership between someone with vast experience and someone who wants to learn. The person in receipt of mentorship may be referred to as a protégé, a protégée, an apprentice or, in the 2000s, the mentor may be referred to as a godfather/godmother or a rabbi. Mentoring is a process always involves communication and is relationship-based. Mentoring in Europe has existed since at least Ancient Greek times, the roots of the practice are lost in antiquity. The word itself was inspired by the character of Mentor in Homers Odyssey, though the actual Mentor in the story is a somewhat ineffective old man, the goddess Athena takes on his appearance in order to guide young Telemachus in his time of difficulty. Mainstream business literature subsequently adopted the terms and concepts, promoting them as pathways to success for all career climbers, in 1970 these terms were not in the general American vocabulary, by the mid-1990s they had become part of everyday speech. The focus of mentoring is to develop the person and so the techniques are broad. Sowing, mentors are often confronted with the difficulty of preparing the learner before he or she is ready to change. Sowing is necessary when you know that what you say may not be understood or even acceptable to learners at first, when change reaches a critical level of pressure, learning can escalate. Here the mentor chooses to plunge the learner right into change, provoking a different way of thinking, this is making something understandable, or using your own example to demonstrate a skill or activity. You show what you are talking about, you show by your own behavior, here the mentor focuses on picking the ripe fruit, it is usually used to create awareness of what was learned by experience and to draw conclusions. The key questions here are, What have you learned, leadership authors Jim Kouzes and Barry Z. Multiple mentors, A new and upcoming trend is having multiple mentors and this can be helpful because we can all learn from each other. 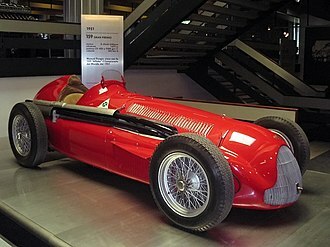 Alfa Romeo participated in Formula One, as both a constructor and engine supplier, from 1950 to 1988. Alfa Romeo had often been a force in Grand Prix racing before World War II, from 1934 to the start of World War II in 1939, Alfa rarely won and their cars looked rather outdated and badly built compared to the high-tech Silver Arrows. When the new Formula One World Championship had come around, Alfa had absolutely dominated post-WWII racing from 1946 to 1949- winning every Grand Prix they entered with the exception of 3. In 1950 Nino Farina won the inaugural World Championship of Drivers in a 158 with supercharger, in 1951 Juan Manuel Fangio won while driving an Alfetta 159. The Alfettas engines were powerful for their capacity, in 1951 the 159 engine was producing around 420 bhp. Surprisingly, Alfa Romeo involvement in racing was made with a thin budget, using mostly pre-war technology. For instance the team won two championships using only nine pre-war built engine blocks, during the 1960s, several minor F1 teams used Alfa Romeo straight-4 engines in cars such as the LDS Mk1 and Mk2 Specials, Coopers and De Tomasos. In the end of 1960s Alfa Romeo was developing a new V8 engine for its racing cars, Alfa Romeo briefly returned to Formula One for the 1970 and 1971 seasons with a V8 engine based on their sportscar unit. In 1970 the unit was entrusted to Andrea de Adamich. The combination often failed to qualify and was uncompetitive when it did run in the races, in 1971 a similar arrangement saw de Adamich run most of the second half of the season in a works March car, with a similar lack of success. For 1976 Bernie Ecclestone did a deal for the Brabham Formula One team to use Alfa Romeo engines based on their new sports car unit. At Murrays instigation Alfa produced a narrower V12 design in three months for the 1979 season, but it continued to be unreliable and fuel inefficient. During 1977, and after persuasion by Chiti, Alfa Romeo gave Autodelta permission to start developing a Formula One car on their behalf. Thus named the Alfa Romeo 177, the car made its debut at the 1979 Belgian Grand Prix, the partnership with Brabham had finished before the end of the season, with Bernie Ecclestones outfit returning to Ford/Cosworth DFV engines. The 1955 Formula One season was the ninth season of FIA Formula One motor racing. 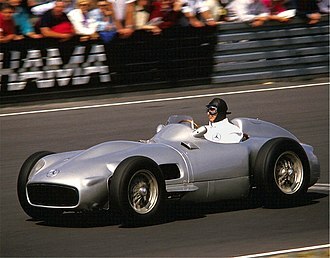 It featured the 1955 World Championship of Drivers, which commenced on 16 January 1955, juan Manuel Fangio won his second consecutive World Championship title in a season that was curtailed by tragedies. The season included a number of non-championship Formula One races, Mercedes drivers again dominated the championship, with Fangio taking four races, and his new team mate Stirling Moss the British Grand Prix. Ferrari won at Monaco after all of the Mercedes cars broke down, although Ascari was apparently unscathed, the double World Champion crashed fatally at Monza while testing sportscars four days later. The disaster at the 24 Hours of Le Mans on 11 June which killed Pierre Levegh and over 80 spectators led to the cancellations of the French, German and Swiss Grands Prix. 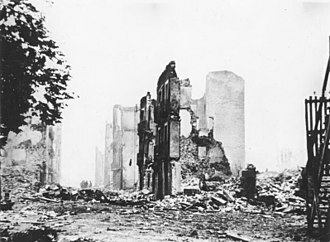 The French round, which was supposed to be held at Reims between the Dutch and British rounds, was cancelled first, the German event at the Nürburgring, the Swiss round at Bremgarten and the Spanish round at Pedralbes followed suit. ERA E-type GP2, entered and driven by Leslie Johnson in the 1948 British Grand Prix. One of many ERA entries for the race.